The flag was created on 11 November 1995, and adopted on 8 March 1996. Want some FOTW icons for your computer? Want to use a flying flag as your screensaver? 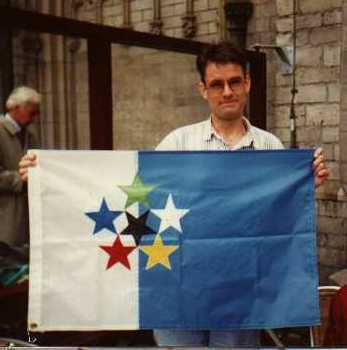 Designer Mark Sensen displaying his FOTW flag, August 1999. Photographed by Jarig Bakker in Amsterdam. Therefore the Official FOTW Flag is "SIX STARS" by Mark Sensen. The FOTW flag follows the general rule that the upper hoist keeps its place as explained elsewhere on this site. I would like to start this new year by sending you a flag-related present, i.e. a proposal for a FOTW burgee. This is just a 3:5 version of Mark Sensen's official FOTW flag. Caption under the photo:"Designer Mark Spenser [sic] with the official flag of the Site, created by himself." To tell you all a little secret: after I designed my proposal I discovered the pentagon in the stars. I was thinking about adding an extra explanation, since the predecessor of the Internet was an idea from The Pentagon. (For those who know the history of the Internet better: correct me if I'm wrong). But I decided to stick with my explanation as intended. Click here to obtain an .ico file. To use the .ico file, fotw.ico, place this anywhere you like (inside the FOTW directory would be appropriate), and use the "Change Icon" function to point to it. Click here to obtain an .ico file. by Bob Kee, 4 March 2001 Others have already provided the procedure, but I wanted to share this icon with you. I use is both as a desk-top icon (32x32 px) and as small icon in the taskbar (16x16px). Click here to obtain an .ico file. Alternatively, you can link to Flagspot, which has provided an icon that can be used with FOTW mirrors. If you aren't familiar with favicon files, they are the custom images you see when you save an Internet Shortcut in newer versions of most browsers. This image should be placed in the root directory of the FOTW website. I've made a collection of flag icons for Mac OS X, available for download at: http://xicons.macnn.com/designer.php?id=148. Hope there are some Mac users here on FOTW who can enjoy them. I am sending an FOTW icon image that I have been using as a desktop icon for the FOTW site. How does one get the icon to appear in the favorites list? Please feel free to use the image for FOTW. Click here to obtain this image as a .ico file. Well, normally, you get them to appear in the favourites list by bookmarking a web site or page that has one already associated with it. It's probably possible to change a favourite whose icon you like to make it point to where you want to point a favourite, but that will most likely suffer from Internet Explorer cleaning up from time to time. If you haven't done so before, visit the web-page you want to mark with this icon, and select "add to favourites" (or whatever short-cut you're using). Check your icon is a 16x16 icon and named 'somethingorother.ico', and store it somewhere where there's no house cleaning (almost any folder that's not called 'Temporary something'. A folder you will be able to recall six months from now has its advantages. Open the favourites list, point at the favourite, right-click for the context-menu and select "Properties". Select "Change Icon", browse to your folder and icon, and open it. You can include a flag as your screensaver using MS Windows 3D Flying objects/Textured Flag screen saver (available in all versions up from Windows 95 plus). 2. Windows will stretch your image to a square. You can't beat this, so join to it by adding below your flag a black area (real black this time, to match the background). Unless you're using a square flag, of course. 3. The fluttering flag will be shown with the hoist to the viewer's right hand, which is not the way most flags are shown by default. Consider this for vertically asymmetrical flags, but mind different-sized designs, usually showing lettering or maps.